Any kind of children’s digital expression on new terminals including tablets, e-book readers, electronic blackboards, signage, smartphones etc, but other than televisions and personal computers. 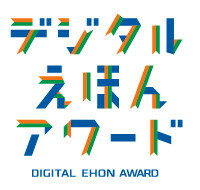 Digital Ehon Award is a digital children’s book award aimed to cultivate innovative digital productions organized in partnership with Digital Children’s Book Fair. Each year, we celebrate and award the world’s most exciting digital productions. Ever since the invention of digital books, many innovative and original digital books have been produced all around the world. Children’s books, which may be the first book that many people read for their first time, is not an exception. We hope that all children’s books, including digital children’s books will encourage children to dream, trigger their imagination, and further help enrich our world. Digital Children’s Book Fair is the world’s leading international digital children’s book fair held in Japan. Children’s books are exhibited via smartphones, tablets, electronic book readers, digital signage and other latest digital devices to deliver its innovative and creative experiences for children. Digital Children’s Book Fair is where children, parents, artists, illustrators, app developers, and distributors meet, discover and enjoy the innovative form of entertainment. “Digital Ehon (Picture Books)” are gathered from all around the word, and has become the world’s leading, most popular children’s digital book fair..
Digital Ehon Inc. was established in 2011, in the hope of producing new tools that will spark children’s imagination, creativity and innovation. Its activities include developing, producing, consulting kid’s related apps, organizing hands on workshops, planning exhibitions and museums, and developing other educational programs. CANVAS(NPO) was established in 2002, aiming to promote creative and expressive activities for children. To date, CANVAS has delivered 3000 workshops to approximately 350,000 children and comprehensively researched the relations between children and media through practice. The annual children’s creative workshop exhibition “Workshop Collection” draws huge crowds, with 100,000 people visiting the event in just two days. Digital Children’s Book Fair Executive Committee has an exciting opportunity for you to become headline sponsor of the book fair and the award! By sponsoring our event, you will be able to maximize the visibility of your brand and build name recognition among participants. Please contact us for further information.